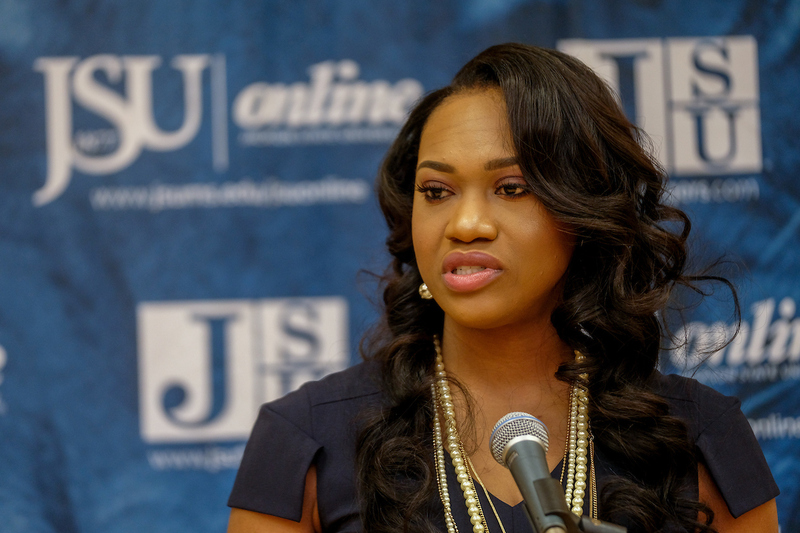 Jackson State University is excited to announce Tomekia Reed as the Tigers Head Women’s Basketball Coach. Reed comes to JSU after a successful three-year stint at Hinds Community College. This past season Reed led HCC to a 16-9 overall record, which included a berth in the NJCAA Region 23 Tournament. The 2016-17 team found similar success and finished with a 21-7 record and qualified for a spot in the Region 23 Tournament. In her three seasons at HCC, Reed sported a 47-29 mark. In Reed’s first season, the Eagles finished 10-13, which was an improvement from a 2-21 mark in the previous year. Prior to HCC, Reed was on the staff at Southern Mississippi. Her responsibilities included all aspects of recruiting, assisting with the Lady Eagles basketball camps and on-the-floor coaching. She worked primarily with post players in skills development, scouting opponents and film breakdown, as well as community relations and service and assisting in the mentoring program. Before joining Southern Miss, Reed spent a season at the University of Louisiana at Lafayette as an assistant coach. Previous to UL, Reed spent three seasons at JSU. While there, she served as the top assistant and recruiting coordinator on the Tigers’ staff. Reed also worked with post players at JSU and served as the team’s academic liaison. Other responsibilities included strength and conditioning liaison, player development, community service coordinator and summer basketball camp coordinator. She tutored Shelita Burns, the 2006-07 SWAC Player of the Year, and helped head coach Denise Taylor rebuild the JSU program into a perennial winner and contender for the Southwestern Athletic Conference title. The Tigers claimed the SWAC regular season championship and made a WNIT appearance in 2006-2007. The 2007- 2008 JSU squad captured the SWAC Tournament championship and made an appearance in the NCAA Tournament. Reed, a native of Jackson, Miss., began her coaching career at South Georgia Technical College, where she served as assistant women’s basketball coach for three seasons. She signed two of Georgia’s top athletes and one of Mississippi’s finest Dandy Dozen players. Reed received an associate’s degree in sports medicine from Hinds Community College after transferring from Southern Miss following her freshman season. She then, attended Georgia Southwestern State University, where she earned a bachelor’s degree in exercise science from GSSU. A former player, Reed was named most valuable player, led the team in scoring and rebounding while at Hinds. She was second in the conference in scoring and first in the conference in rebounding. Reed was named MJCAA first-team for her effort. While at Southern Miss, Reed received the coach’s award, was named most improved player and helped the team make it to the WNIT versus Georgia Tech in the 1999-2000 season. At Georgia Southwestern State, she led the team in scoring and was named team Most Valuable Player. Reed is a member of Delta Sigma Theta Sorority, Inc. She is the daughter of John and Cazinova Reed.